‘Braving the Dragons’ is the name of a conference that will explore the uncharted territory at the meeting point between art and archaeology. 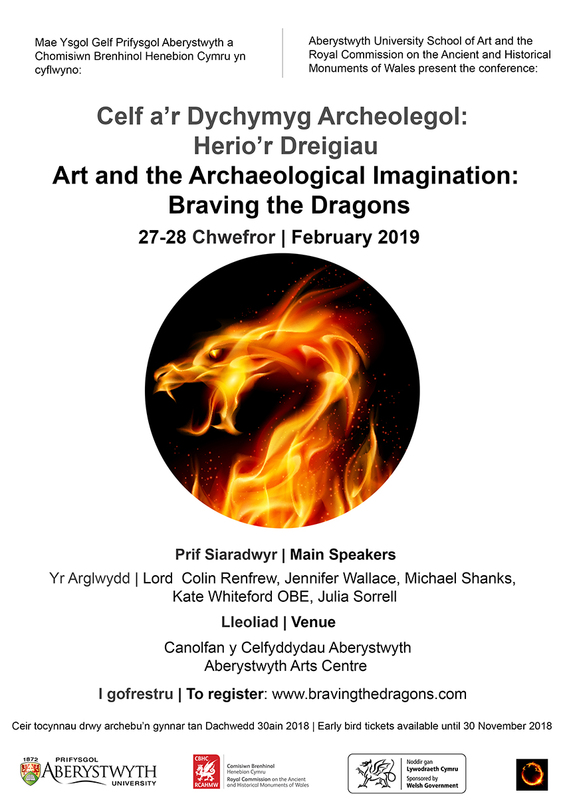 Leading practitioners in both disciplines will meet at the Aberystwyth Arts Centre on 27 and 28 February 2019 to explore ways in which artists are inspired by archaeological methods and discoveries, and ways in which archaeology is, in many respects, an artistic endeavour. The conference is the idea of Carmen Mills, artist in residence with the Royal Commission on the Ancient and Historical Monuments of Wales, whose solo exhibitions include ‘Time Beneath our Feet’ (2016, National Assembly for Wales, Cardiff), ‘The Archaeologist’s Dance’ (2014, part of Scarborough’s bi-annual Coastival festival) and ‘Excavations 1’ (2013), based on archaeological sites at Star Carr, North Yorkshire, and Streethouses, Loftus, in Cleveland, at the Studio Gallery, Scarborough. Carmen believes that this is the first time that archaeologists and artists have met to engage in what she hopes will be a fruitful exchange of ideas that will help to define new fields of academic study and artistic practice. ‘The intersections between art and archaeology go well beyond the familiar world of archaeological illustration and reconstruction drawings. I am looking forward to the interaction between the two disciplines’. Christopher Catling, Secretary of the Royal Commission, said, ‘I think archaeologists are beginning to understand that the past cannot be interpreted solely in terms of practicalities: we will not fully enter the minds of our ancestors until we appreciate that the artistic impulse is evident in a Neolithic polished axe and an Iron Age hillfort, and that artists have in the past been the innovators, leading humans into new areas of experience’. The conference will be opened by AM Lord Dafydd Elis-Thomas, Welsh Government Minister for Culture, Tourism and Sport. Keynote archaeological speakers include Professor Colin Renfrew (Lord Renfrew of Kaimsthorn), author of Figuring It Out: What are We? Where do we Come From? The Parallel Visions of Artists and Archaeologists (2004), Professor Jennifer Wallace, author of Digging the Dirt: The Archaeological Imagination (2004), and Professor Michael Shanks, author of The Archaeological Imagination (2016). Among the artists speaking are Kate Whiteford OBE, who says that ‘the pull of the past, history and myth, symbols and signs’ form a persistent thread running through her work; Julia Sorrell, whose recent work is based on the landscape and prehistoric monuments on Orkney; and Professor John Harvey, who is both a historian of art and an art practitioner fascinated by the sounds of the past, having recently convened a conference to explore ‘The Noises of Art: Audiovisual Practice in History, Theory and Culture’. Stay informed by subscribing to the Royal Commission’s news feed.